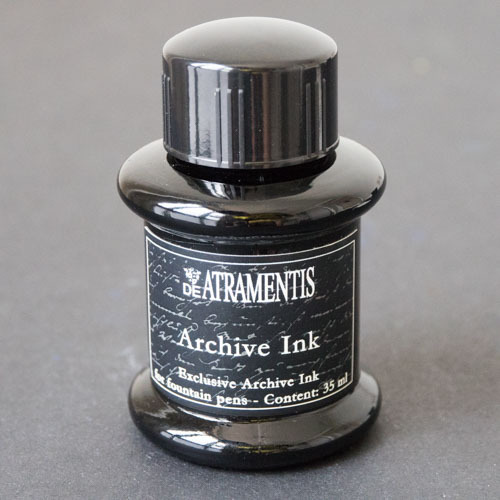 I've featured De Atramentis Archive Ink before in 2014 when a friend wrote a review for that on my blog. Recently, I discovered that I actually have a bottle of it in my drawer, so maybe I should give my take on it as well. De Atramentis is a German company that produces handmade fountain pen inks. One of the specialties of De Atramentis is their waterproof coloured fountain pen inks. But today, we're not going to talk about the colour inks, we're going to talk about the Archive Ink. 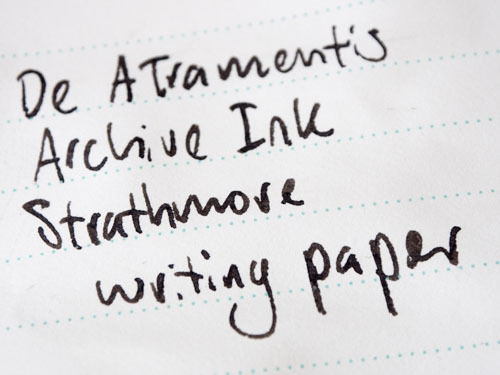 The Archive Ink is one of two waterproof black inks that De Atramentis make, the other is Document Ink. Both are black and waterproof so I don't know the reasons for having two inks that are essentially similar. Anyway, I can't compare since I don't have the Document Ink. Here are some writing samples on various paper, written and dried, then washed over with water. This lines have really sharp edges and do not feature. The jaggedness is caused by the texture of the coldpress paper. This paper has more of a fine grain texture and it's a very thirsty paper. I wasn't able to create lines with sharp edges even though wrote really slowly. This paper is much smoother and lines appear bold and have sharp edges. 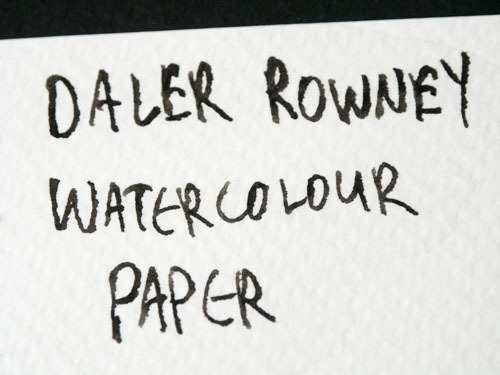 It's a good paper for pen and ink work, but doesn't work too well with watercolour. The ink works well here too. 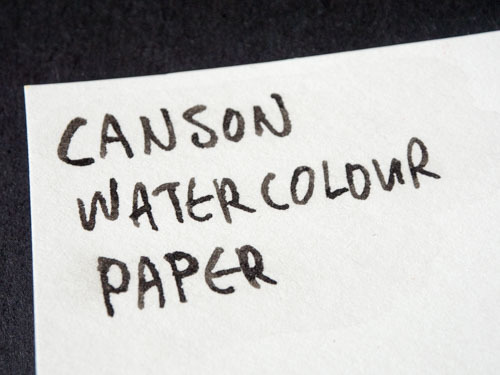 I chose the Canson watercolour paper and Strathmore Writing Paper because in my earlier test with Noodler's Bulletproof Black Ink, the ink actually featured on those two paper. As you can see, the De Atramentis performed better, and more consistently across all the paper. 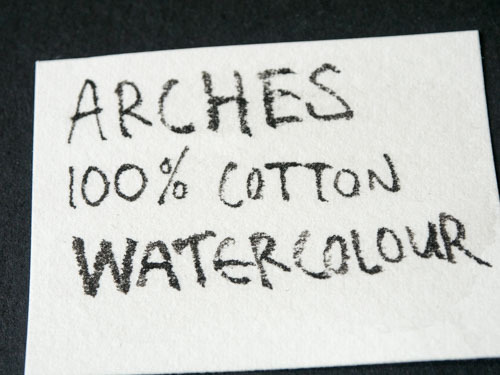 The ink is also totally waterproof when dry, which makes it a suitable ink for use with watercolour or mix media art. The ink also dries fast, well, much faster than Noodler's Bulletproof Black Ink anyway. Overall, the De Atramentis is an excellent ink. It's said to be safe for fountain pen use, but I do recommend washing out your fountain pens occasionally though as a precaution. There's no mention what the ink is made of. The only downside is this ink is more expensive compared to other waterproof black inks, such as the Platinum Carbon Ink and Sailor KiwaGuro. document ink fulfills a norm required for official documents, which includes a degree of lightfastness, no traceless removal, waterproof enough to leave writing intact and legible, and resistance against a set of solvents. the archive ink is a less stringent version – it’s still a waterproof, lightfast ink, but not to the degree of fulfilling the official norm. i found people quote an older version of the de atramentis website with the guideline that archive ink is for personal use, and document ink is for notary etc. use. this sounds pretty sensible on the face of it, but since they have the same list price on their website, and the document ink comes in a selection of colours, i’m not sure if that reasoning still holds up. I read elsewhere that Document Black is dye based whereas Archive Black is pigment based.